29th April 2011. In this edition we release the NEW ExplorOz Mouse Mat, and ExplorOz Drink Coaster, plus we have a great discount offer on the Globalsat BU-353 Mouse GPS and loads of other great news you can't afford to miss reading. As we send out this, our 232nd ExplorOz newsletter, we also celebrate having just sent Edition #1 of the TriathlonOz newsletter. For those that aren't aware, we recently launched a 2nd website based on the same concept/structure as ExplorOz but aimed at the enthusiastic and rapidly growing Australian Triathlon and Multisport market. Take a peek at our first newsletter here and feel free to register or even take advantage of the $10 introductory Membership special offer! Back on the home front, we hope you like the NEW ExplorOz Mouse Mat! In fact, for just $9.95 ($9.45 for members), you'll get both a mouse mat AND a coaster, featuring a totally new design sure to brighten up your desk. Check it out in the shop. We’ve just received our latest shipment of the best selling Globalsat BU-353 Mouse GPS and, thanks to the strength of the Aussie Dollar, we have slashed our retail price down to just $60! Get in quick as this price is available for a limited time only! 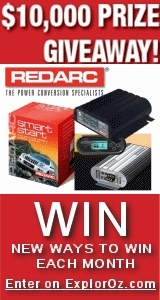 How would you like to win a Redarc Battery Charger worth $495? All you have to do is purchase a Premium Display Ad for just $29.95 in the ExplorOzClassifieds before 31st May and you'll be in the draw. Full Competition Details, Terms & Conditions, are available online. If your name is listed below, please contact our office on (08) 9403 3737, or email info@exploroz.com before Friday 6th May. Unclaimed prizes must be redrawn. David & Margaret M, from VIC listed an Australian Offroad Camper for sale with a Premium Ad in the ExplorOz Classifieds. They pick up a Redarc Battery Charger, worth $495, congratulations! Darren M4, from QLD is also a winner in our Classifieds promotion. Darren also listed an Australian Offroad Camper and has already sold it! He also wins a Redarc Battery Charger! David McGarvey, from NSW registered as an ExplorOz visitor on 25th April and won this fortnight's new-registration draw. He scores himself a Redarc Smart Start Dual Battery Isolator worth $165. Because a happy wife = happy life! Have you noticed the Smartwool Women's PHD socks stocked in the ExplorOz shop? For Mothers' Day you better take a look. Specifically designed for a woman's foot and made from 76% Merino Wool, these socks are so warm and comfortable they're sure to impress! Another must-have is the new title in the popular Caravan Chef series. The Complete Caravan Chef book combines the extremely popular Caravan Chef 1 and Caravan Chef 2 into one volume, all for only $29.95 ($28.45 for members). Plus the book contains 30 brand new recipes including 10 dessert recipes. The book is spiral bound for ease of use, and is in stock and ready for overnight delivery!